Hey Beautiful People! Hope you all had a wonderful weekend. Are you ready for Fall cos Summer is gonna be over in about a week. It's already getting chilly in mornings and evenings in the DMV area. I love Summer fashion with its bright colors and bold prints but I am so ready for Fall Fashion. Layering, Scarfs, Blazers, Booties, Tights, and Dark Hues; I am so excited about this upcoming Fall season and I can't wait to share my outfits with you all. This outfit was what I wore to school on Friday; I threw on a couple of pieces together and BAM! I have on a casual Fall outfit. 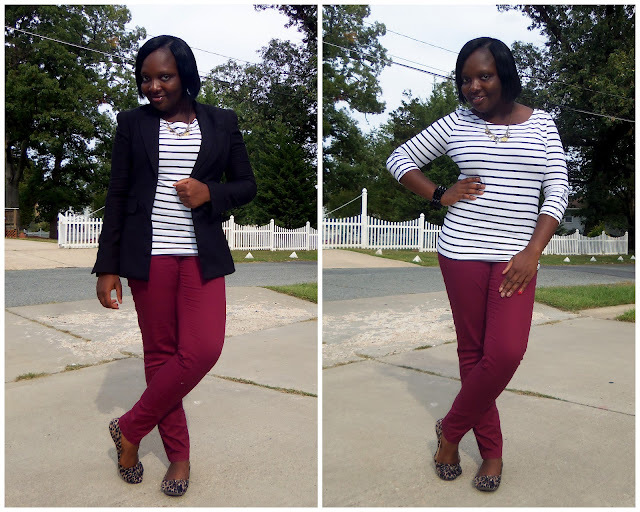 I wore a pair of jeans in one of Fall's trendy colors (Oxblood-a brownish burgundy color). I also got this for only $12.95 at H&M. I paired it with a classic striped top and added a pair of animal print flats. I also added a blazer in the morning since it was a bit cold. I hope you all like this outfit...:) Thanks for visiting my blog and HAVE A GREAT WEEK! I would love to have some jeans that color! I love it and the pants are fierce. I'm ready for fall too girl! Love the pants! I'm so ready for fall fashion but not the weather, I like your outfit combo you look amazing! P.S. Happy to be follower 100! Super cute! Love those pants. Popping over from Bloggers Do It Better. such a pretty colored jeans, love this style...rocks!